Lightly toasted bread topped with diced vegetables. 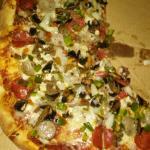 Olives, & gorgonzola cheese. Finished with a drizzle of EVOO, & a balsamic glaze. 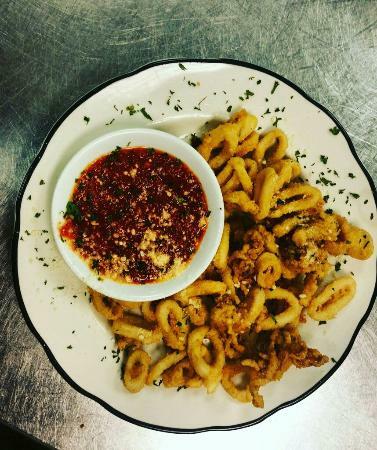 Tender calamari beautifully dusted with our special blend of seasonings, then fried to the perfect golden brown. Our signature marinara is on the side for dipping. Vine ripe tomatoes with fresh mozzarella and basil with a drizzle or EVOO, and our balsamic glaze. A generous portion of meaty, green lip mussels, lightly tossed in our signature marinara make this the house favorite. Slices of fresh mozzarella. 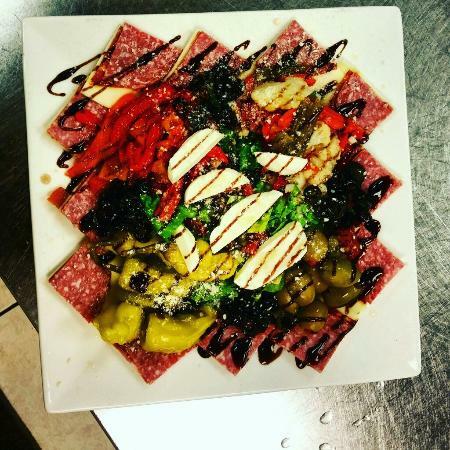 provolone, Italian cold cuts, a scoop of our delicious bruschetta topping, roasted red peppers, Italian vegetables top romaine leaves, and a delicate bed of mixed greens. Finished with fresh parmesan and an EVOO drizzle. No cups in our kitchen! You gel a whole bowl of these delicious soups, just like Nana gate us! An Italian favorite’ Hearty chicken stock with escarole. swiss chard and white beans. Top this with parmesan cheese, and it’s heaven in a bowl. This family favorite is a delightful combination or onion. and roasted garlic pureed until silky smooth. Finished with light cream, parmesan cheese, and a splash of citrus. Freshly sliced tomato, cucumber, red onion and black olives over a bed of crisp greens. The house favorite featuring roasted eggplant, sliced red onion, black olives, and parmesan over a bed of spinach. We finish it with a drizzle of extra virgin olive oil. 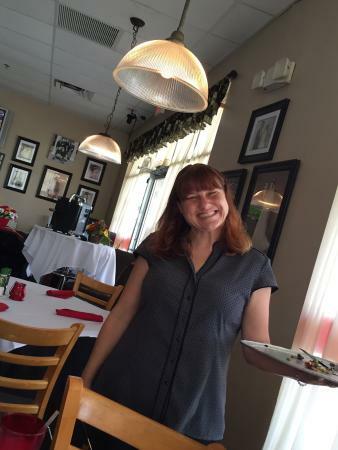 Gnocchi & gluten free pasta are also available for an additional charge. Served with a small house salad. Your choice of pasta served with our signature marinara, or Aglio olio - garlic and olive oil. Traditional creamy Alfredo sauce over a bed of fettucine. Gnocchi & gluten free spaghetti ore also available for on additional charge. Served with a small house salad. Tramontana's signature lasagna authentic Italian meatless lasagna baked in our delicious marinara. Tender​ ziti tossed in our marinara, then baked with creamy ricotta and parmesan cheese. 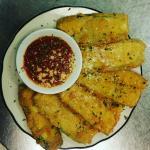 Thinly sliced, hand breaded eggplant, fried and layered with our signature marinara, and fresh cheeses, then baked to perfection. Pillows of pasta filled with a blend of Italian cheeses. 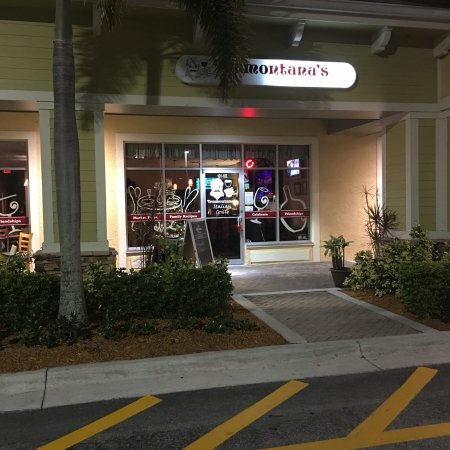 Served with our signature marinara, and your choice of meatballs, or hot or mild Italian sausage. Hand breaded chicken cutlets smothered in our signature marinara, topped with mozzarella cheese, then baked to perfection. Served with your choice of pasta. Hand breaded veal cutlets smothered in our signature marinara, topped with mozzarella cheese, then baked to perfection. Served with your choice of pasta. Hot or mild sausage sauteed with peppers & onions, and served over thinly sliced pan fried potatoes. 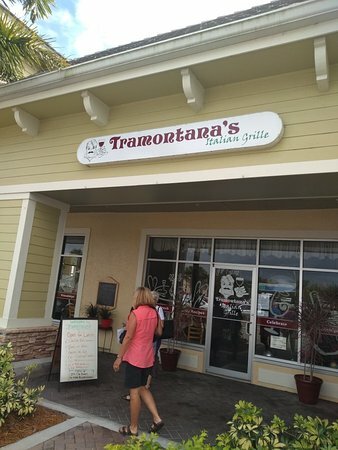 A Tramontana family favorite! Our signature Italian Meatloaf just like Nana used to make! We take our meatball recipe, stuff it with pepperoni, mozzarella, parmesan and hard boiled eggs. It's baked to perfection, and topped with our signature marinara. Served with potatoes and vegetable. Lightly dusted chicken medallions sauteed in a sweet marsala & mushroom sauce. Served with choice of pasta. Lightly​ dusted chicken medallions sautéed with fresh mushrooms and capers, then finished with a lemon butter & white wine sauce. Served with choice of pasta. A hearty, classic Italian comfort food. Our tender chicken, or Italian sausage is braised in a tomato sauce that is slowly cooked with peppers, onions, and red wine to produce a sauce that is deep red in color, and even deeper in flavor. Lightly dusted veal medallions sauteed in a sweet marsala & mushroom sauce. Served with choice of pasta. Lightly dusted veal medallions sauteed with fresh mushrooms and capers, then finished with a lemon butter & white wine sauce. Served with choice of pasta. 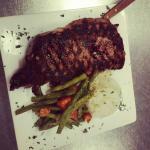 All of our steaks are hand cut. Served with potato and vegetable and a small house salad. The big Daddy of steaks’ 16 ounces of charbroiled ribeye. Tender, juicy, delicious! A tender 8 ounce charbroiled filet, cooked to perfection. 始终是一个很棒的地方去特拉蒙塔纳的! 这是我最喜欢的意大利餐厅 - 当地人喜欢在佛罗里达! 这里的食物很棒和约翰,这里的老板和厨师,穿过整个菜单做得很好。 这里的气氛是非常典型的意大利式的和它会给你一个温暖而舒适的感觉! 它还有一个漂亮的酒吧区。 这里的服务很棒而且他们总是尽最大的努力让您的用餐体验非常人性化和很好的。 他们有一个漂亮的啤酒和葡萄酒菜单。 我一直都很喜欢吃意大利菜的一个不错的chanti葡萄酒! 很棒! 我们去一个新地方和周一晚上的特别之处。 让我们失望的是我们不是自制的意大利面,但了解涉及的人力。 酱料也很棒的自制肉丸,开胃小吃和贻贝。 Emily ,我们的服务器,再没有比这更令人愉快的服务周到。 我们还会回来的!